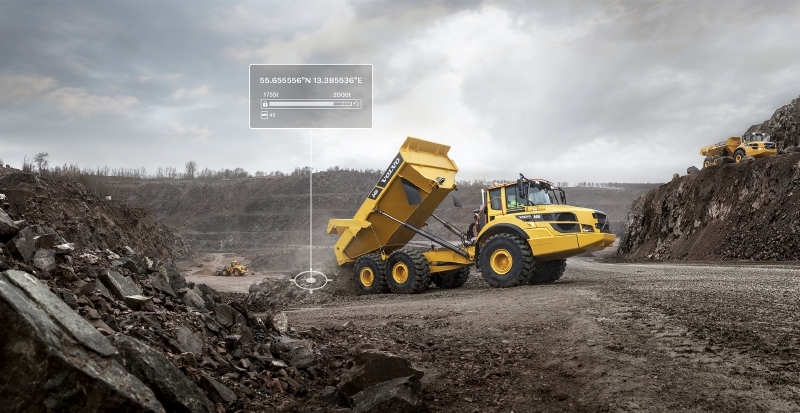 Volvo’s latest update in a suite of applications offered for the Co-Pilot interface Haul Assist now features a real-time tracking map that helps improve hauler fleet flow on site, along with the efficiency-boosting on-board weighing feature. The in-cab interface allows operators to not only identify their position but also the position of other haulers fitted with the technology. This knowledge comes into its own on sites with restricted visibility, allowing operators to see where other haulers are, thereby reducing potentially dangerous situations. In all circumstances, being able to monitor traffic flow helps operators anticipate the optimum arrival time at load or dump areas, thereby avoiding congestion and waiting times, and improving overall site efficiency. The map function can plot haul roads and preferred routes to help operators navigate their way around the site. It can highlight when the hauler is approaching a pre-defined section of narrow or single lane road, and even visualise meeting/passing areas. The map can also highlight any reference points or notable areas of the site. Load and dump zones can not only be visualised on the map, but can also trigger certain sub-functions, such as activating on-board weighing information. This helps to optimise the haul cycle by ensuring every journey moves the correct payload. The system eliminates under-loading for enhanced productivity and over-loading that increases machine wear and fuel consumption. See how Caterpillar's mining division uses technology for remote maintenance.